Rockstar Energy Racing experienced continued success at Budds Creek in Maryland. Jason Anderson carried his momentum from Redbud with his 2nd consecutive podium on a very rough track. In fact all of the tracks from the past few weeks have been much tougher than years past and Anderson is handling the terrain very well. Jason Anderson clearly found his speed in the 2nd moto at Redbud. It was obvious in the way he was riding and attacking the track. 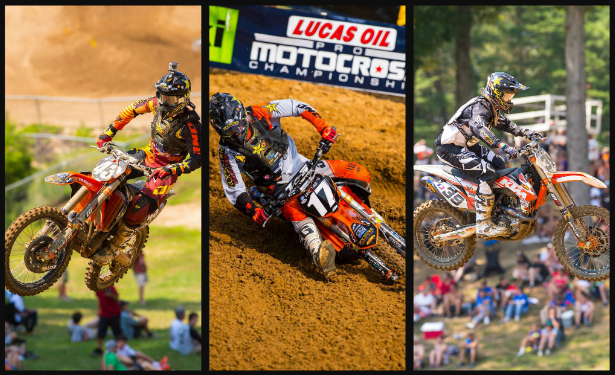 That high carried into Budds Creek as he was on top of the leader board in both qualifying practices. He was just knocked down to second place on the last lap of the second practice. Barely missing out on the bomb award, given to the fastest qualifier. He started the first moto in the top 5 and quickly moved into the lead after a couple very impressive passes. The first on Christophe Pourcel as he railed around a turn standing up on the outside. The 2nd would put him into the lead as he overtook Justin Bogle. Again coming from the outside, Bogle moved over on him, seemingly giving him no place to go. He scrubbed a bump going up a hill, banked off a wall and still found a way to set Bogle up and move by him. He was able to hold off a hard charging Jeremy Martin en route to his first career outdoor motocross win. His second moto did not go as well in the sweltering heat as he rode his way to a finish outside of the top 5. His effort was still enough to garner him his 3rd podium in 5 races. Joey Savatgy had another weekend that just didn't go his way. After putting in good lap times in practice garnering him a good gate pick, the day quite simply just went downhill. He got out of the gate good in moto 1, only to be collected in a first turn crash with Marvin Musquin. The 2nd moto, he found himself on the ground once again and coming from the back of the pack. He did the best he could and managed a finish just inside the top 20. The only thing Joey can do is try to stay positive going into next week as well as the rest of the season. Joey Savatgy: Weekend was just a struggle. I had a good qualifying time but I ended up in a first turn pile up in moto 1 and crashed in moto 2. I really need to have a better day at Millville." Ryan Sipes also had a day with not much positivity. Still dialing the bike in after only one race aboard the team's KTM 450, he was improving a lot throughout practice. He had some confidence going into moto 1, being much more comfortable on his machine. Then on the step up just after the first turn, he landed and his toe caught a rut on the roller just beyond. Sometimes when that happens, it hurts terribly but just goes away in a couple laps. That was Ryan's hope as he continued forward. That was not the case however as he was forced to pull off. He went to Asterisk for x-rays and luckily nothing was broken, but he couldn't even put any weight on that side to walk. He had the doctors tape it up and went out to give moto 2 a go. Surprisingly he was riding really well despite the issue and was inside the top ten. Unfortunately the ankle injury worsened and once again he was unable to finish. Ryan Sipes: "This weekend for a lack of better terms sucked. I felt pretty decent and I kept feeling better all day. I was really concentrating on fixing some of my mistakes from practice. I got a fairly good start in the first moto then the very first jump I turned my ankle. I didn't crash, my feet didn't come off or anything, I just turned it and it popped pretty good. It was painful and I sort of aggravated an old injury from 7 years ago. I went and got it taped and decided I would try to gut it out for the 2nd one. I felt pretty good and I passed up to 8th. I flat landed a really small jump and it made it much worse. I didn't get to finish either moto which bums me out cause I hate not finishing. I plan to be back next week for Millville." The team will now make it's way to Millville Minnesota and the hills of the Spring Creek Motocross track. Anderson who finished on the podium for the first time there a year ago will want to extend his podium streak on a track he really enjoys. Savatgy will hope to finally have some good fortune come his way for a top ten overall. Sipes will have to stay off the bike and his ankle all week to allow it to heal as much as possible.